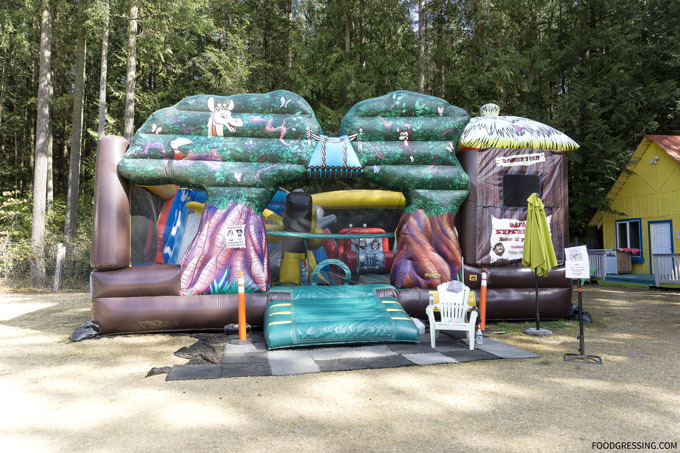 Since then, the park has moved, down-sized and rebranded as simply a dinosaur-themed park without the Flintstones licensing. 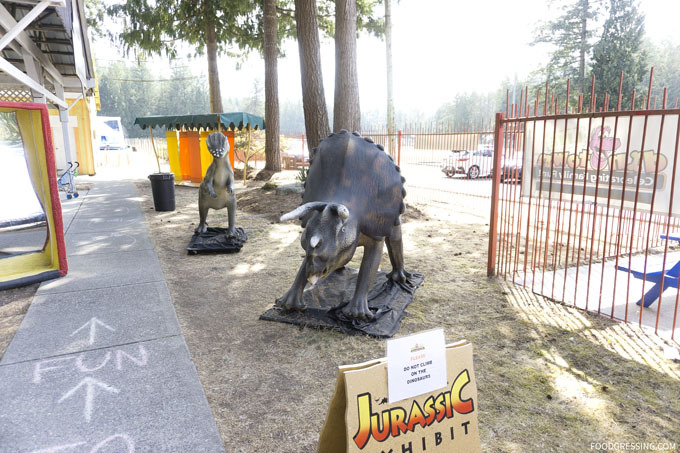 I recently took my son to Dinotown for the first time which is now located by Cultus Lake in Chilliwack, BC. This apparently will be their final season. 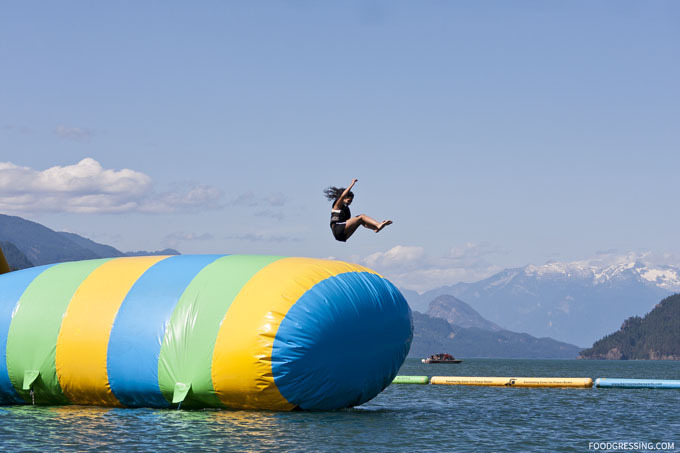 We went on a Wednesday where you receive one free adult admission with a paid child admission. 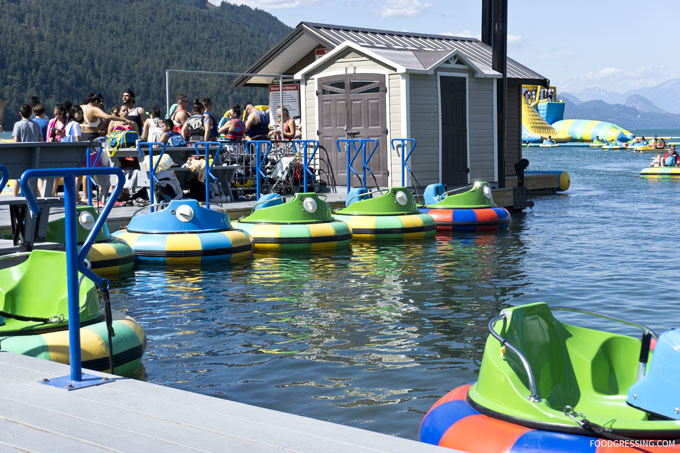 Regular child admission (height 35” – 54”) is $11.95, adults is $9.95 and seniors is $7.95. 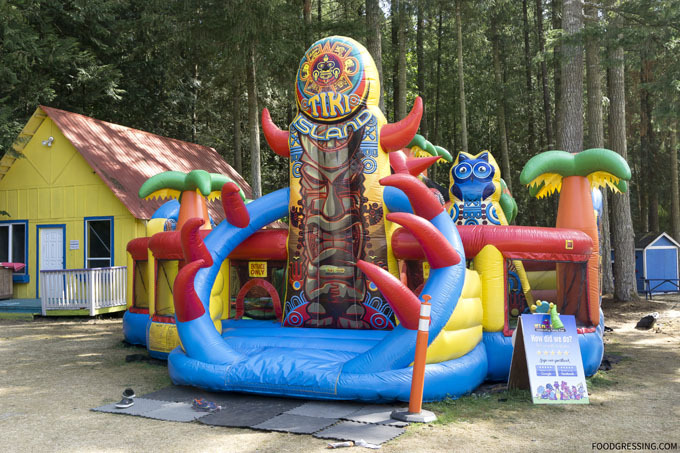 At the park, we found numerous inflatable fun which are definitely a step-up from some of the bouncy castles I have seen. 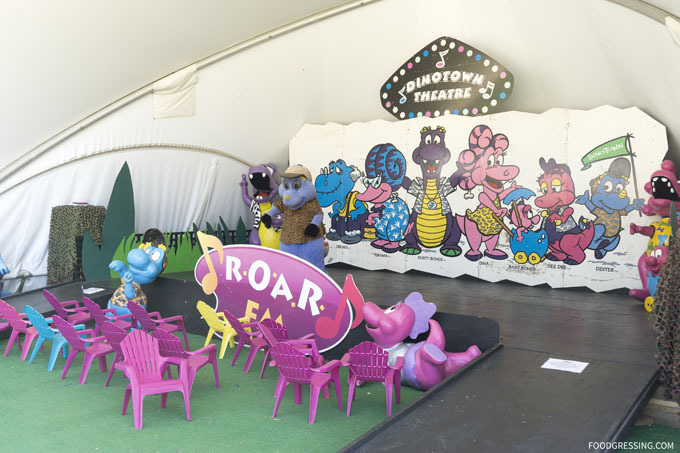 They also have daily live shows where a dinosaur character dances across the stage and kids are welcome to join in. My son quite liked the clown-a-round mini golf. 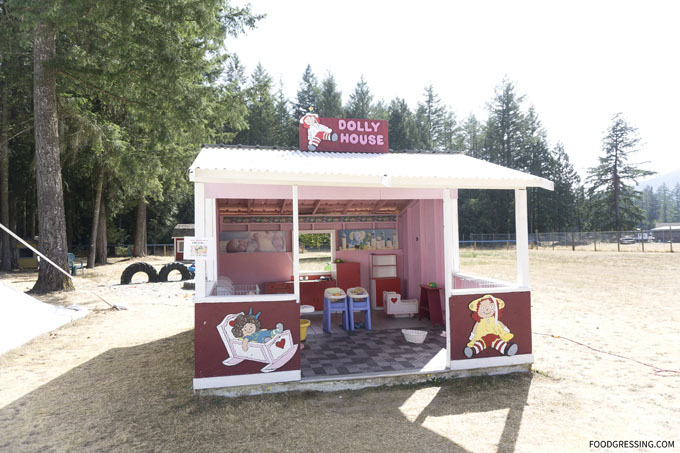 There were also many make-believe huts for kids to visit like a bakery, police station, animal hospital and more. The grounds were quite well kept and I liked the fact that there were many trees to offer shade. It wasn’t particularly busy on the day that we went despite the Wednesday deal. 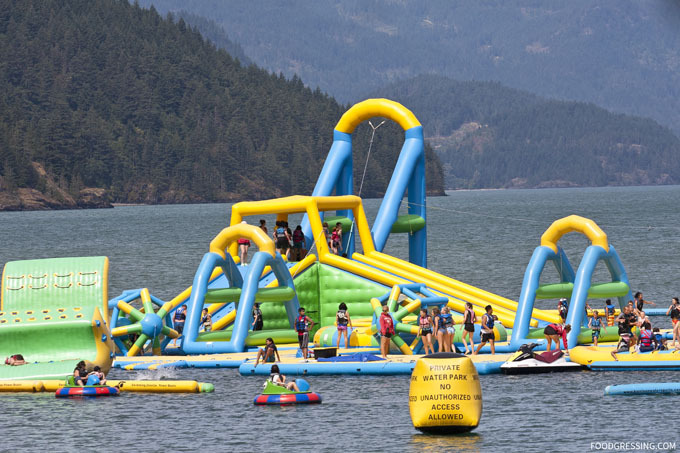 There were many activities available and it was never overcrowded at any of the areas. 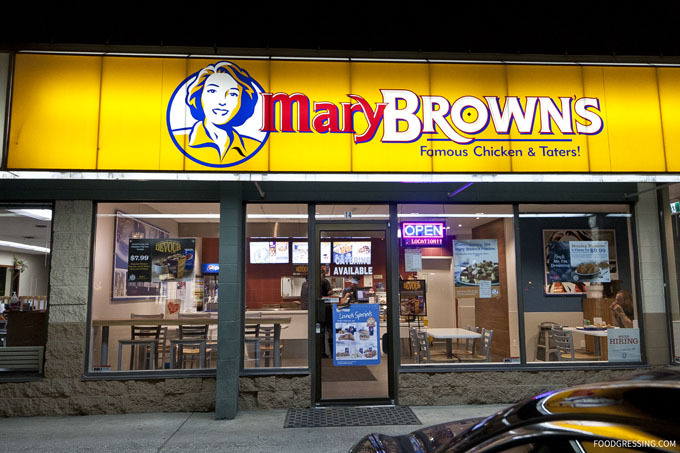 When my family and I were vacationing in Kelowna last year, we came across a Mary Brown‘s in a strip mall near our hotel. Up until that point, I hadn’t heard of Mary Brown’s at all. Much to my surprise, a quick review of their Wiki showed that Mary Brown’s is a 100% Canadian-owned company known for their Big Mary sandwich, chicken and taters. 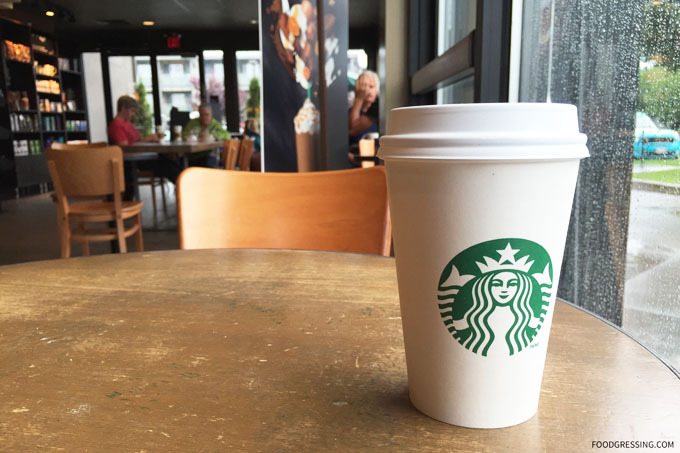 They originated in St. John’s and most of their 100+ locations are in Newfoundland. 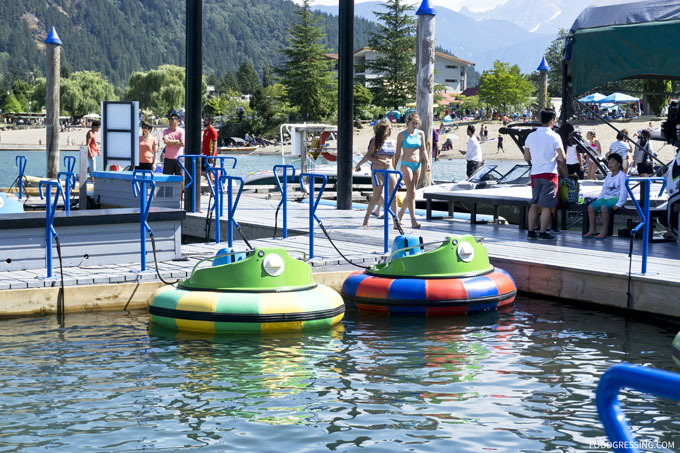 In BC, they have only 6 locations but none in Metro Vancouver; these are in Fort St. John, Dawson Creek, Merritt, Kelowna, Kamloops, and Chiliwack. We were curious as to how Mary Brown’s fried chicken tasted compared to the usual chains like KFC and Church’s so decided to give them a try. Mary Brown’s in Kelowna has a much cleaner and modern interior compared to the fried chicken eateries I regularly go to. 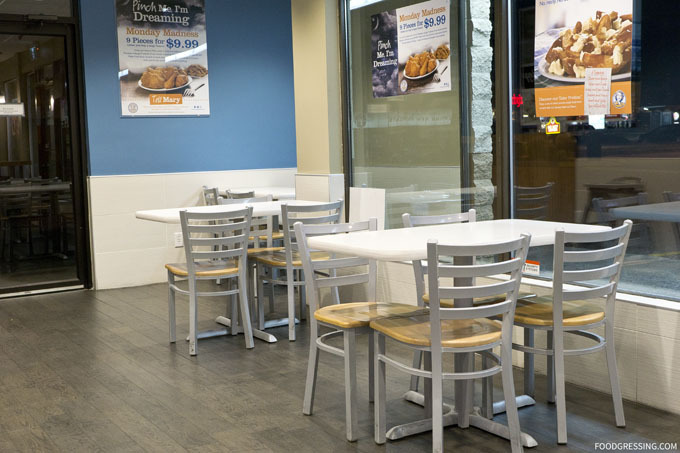 I was impressed with how well the dining area seemed to be maintained – a stark contrast to those sticky, dirty tables I experienced at Church’s in North Burnaby. We ordered two chicken wings, two breasts, taters and chicken pop-ins. 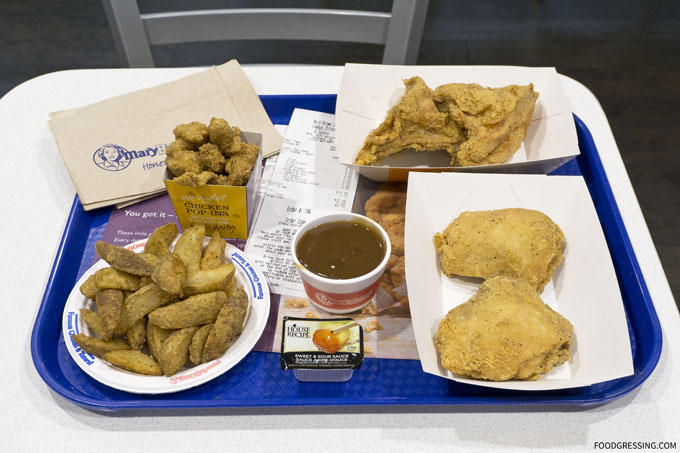 The order actually took about 10 minutes to arrive which suggests they fry the chicken on order. This probably makes sense as there is not enough customer traffic to support ready-fried chicken. 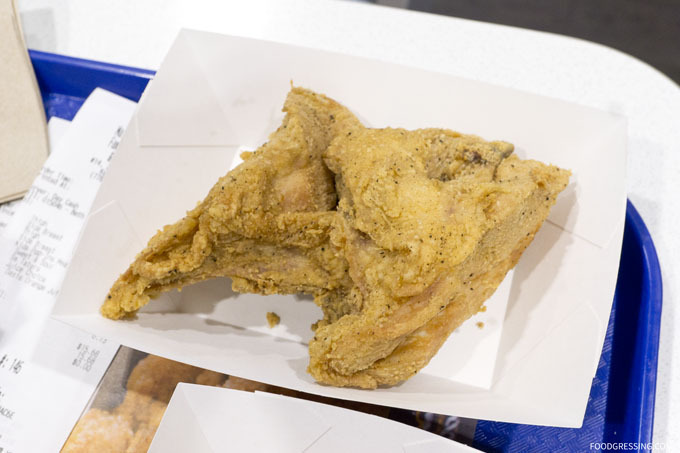 In general, I thought that the batter for the chicken was nicely crispy but seasoned more lightly and was also less greasy than KFC and Church’s. The meat was tender, moist and juicy – no complaints here. 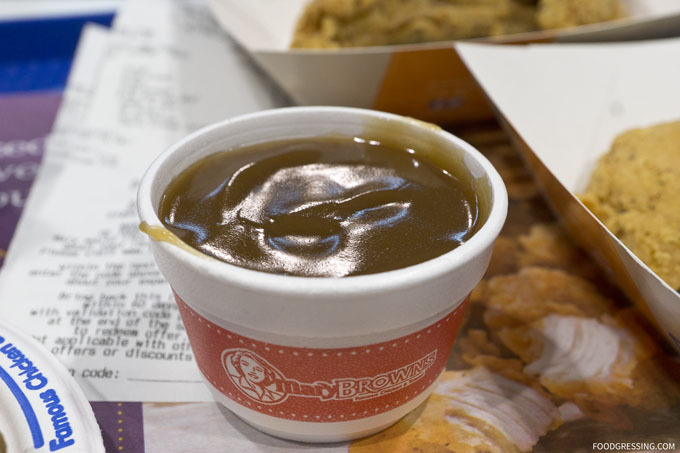 The gravy was just OK; I think I enjoy KFC’s gravy the most in terms of flavour. 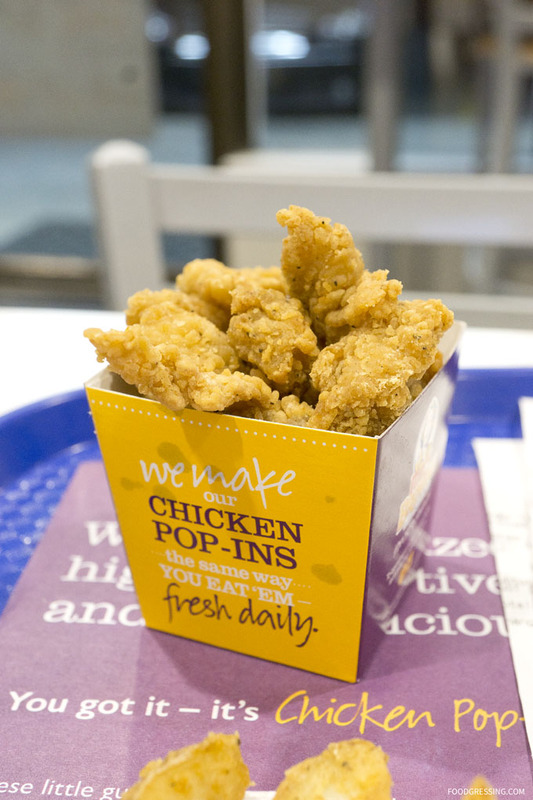 The chicken pop-ins were bite-size, tasty morsels. They were good though nothing to write home about. The taters were the most disappointing and perhaps needed more frying time. They weren’t all that crispy on the outside. 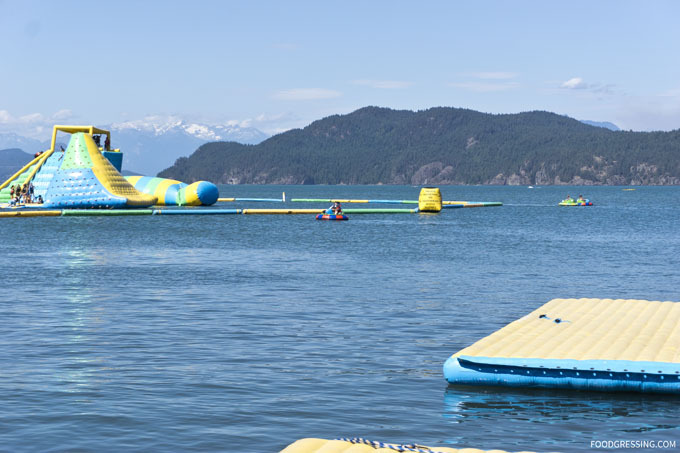 When my family and I visited Kelowna last fall, one of the places that popped as a must-try was Mad Mango Cafe. 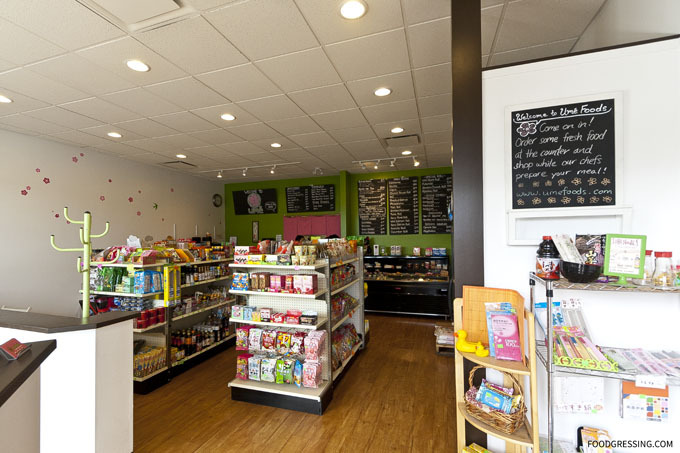 This hold-in-the-wall cafe located in the heart of Downtown Kelowna (on Bernard and St. Paul Street) has been around for over 13 years. 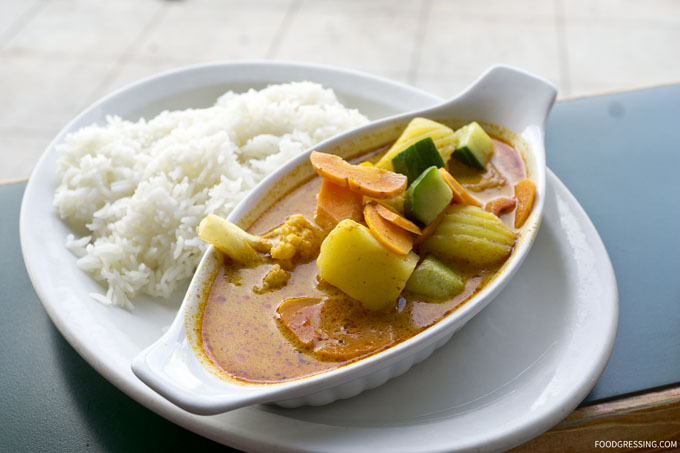 Mad Mango Cafe is very popular with locals and is known for their tasty, affordable breakfast and lunch options both Asian-inspired and North American-style. 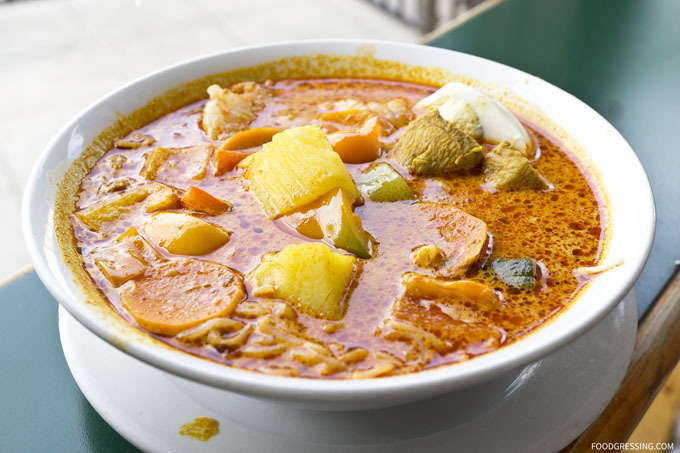 Their most famous dish is the laksa and many have raved about it online. With near perfect ratings on TripAdvisor, Yelp and Zomato, I decided to pay this eatery a visit during the trip. 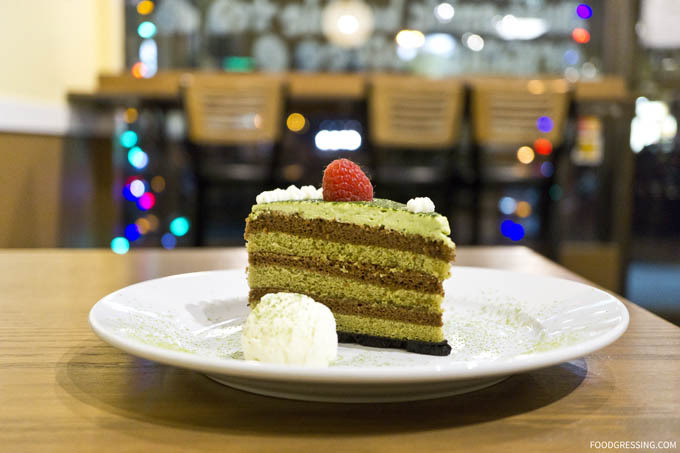 To say that Mad Mango Cafe is a local favourite is an understatement. 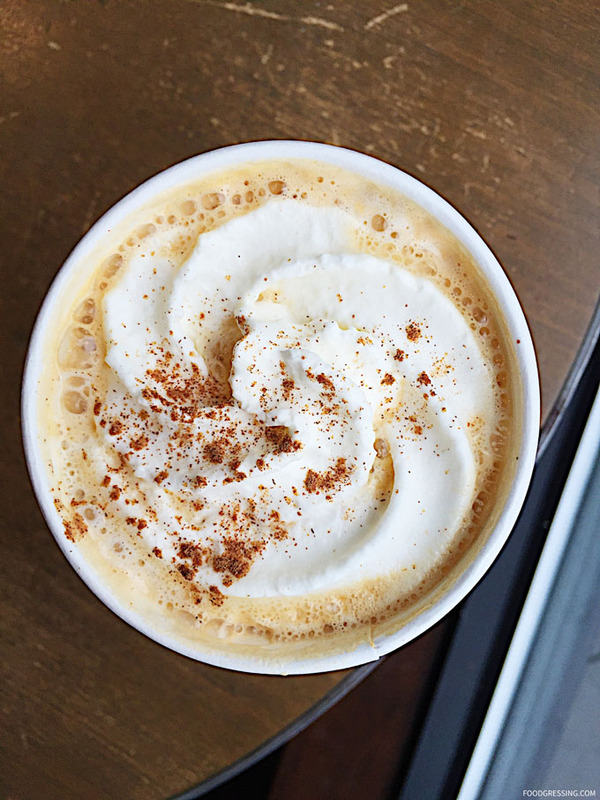 As this article describes, Mad Mango Cafe has a special place in the heart of the community and the owner, Patricia Wong, is pretty much a local celebrity. This restaurant has so much love that two customers decided to put together a Youtube documentary to tell their story. The first video includes an interview with the filmmakers behind the documentary and the second video is the actual documentary. Pat’s story is touching and her passion for Mad Mango Cafe and the community it serves is palpable. 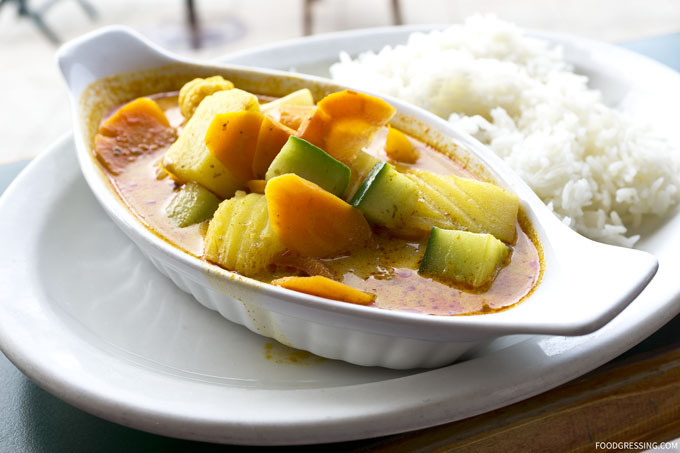 The menu at Mad Mango includes curry soups, wonton soup, vermicelli bowls, Thai soups, Vietnamese Pho, sandwiches are more. They also do all day breakfast with staples like French toast, bagel with cream cheese and mango jam and breakfast wraps. 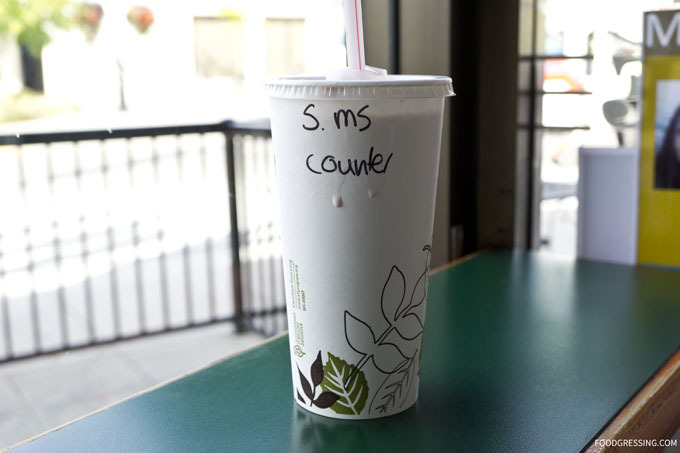 For drinks, there are milkshakes and smoothies. I have reposted their menu below. 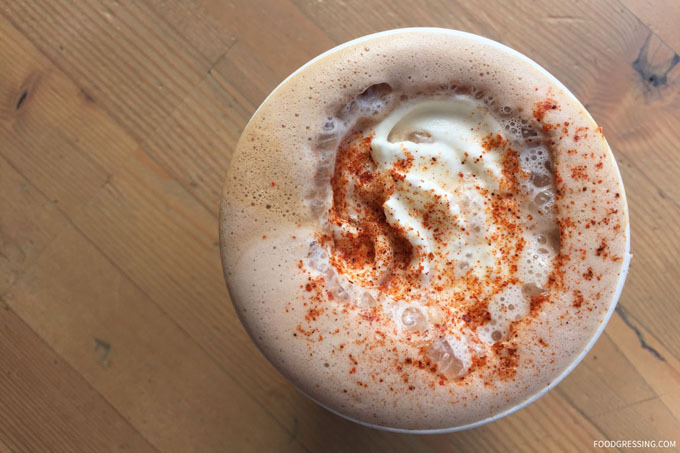 The menu is budget-friendly and items are generally $10 or less. 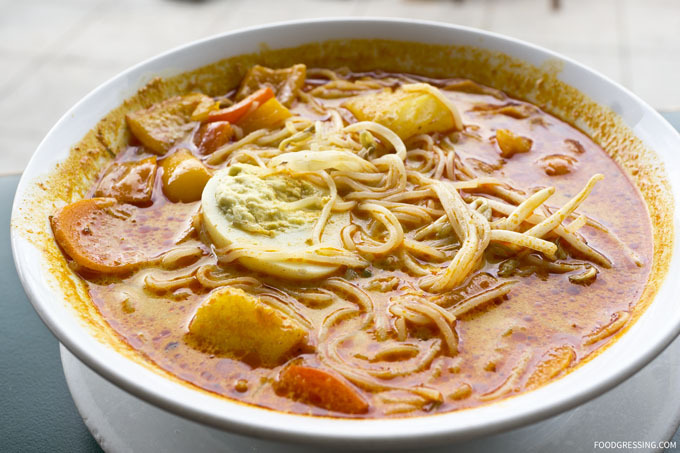 The laksa soup featured vermicelli rice noodles in Malaysian coconut curry with prawns, chicken, and half a hard boiled egg with assorted veggies. The curry was very flavourful and had a subtle spicy kick to it. It was more on the soupy side rather than dense. Vegetables tasted quite fresh but I think the potato chunks could be cut smaller. Portions of noodles and vegetables were excellent but I would have liked more protein. Since the bowl is priced at $8.25, it’s probably within reason. Too bad there aren’t any options for protein add-ons. The curry chicken rice was also flavourful but more veggie heavy than chicken. For the price of $8, I figured it’s acceptable. The strawberry mikshake was pretty good: thick, decent strawberry flavour and reasonable level of sweetness. 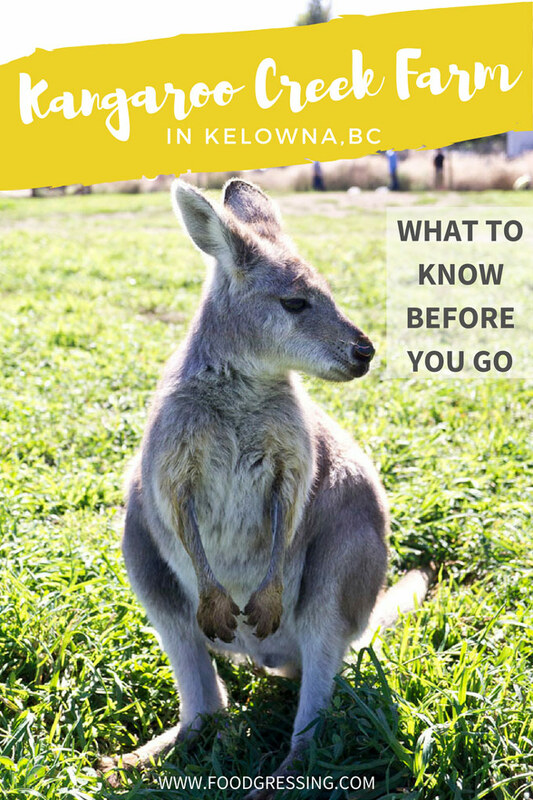 On your next visit to Kelowna, you might just want to hop on over to the Kangaroo Creek Farm. 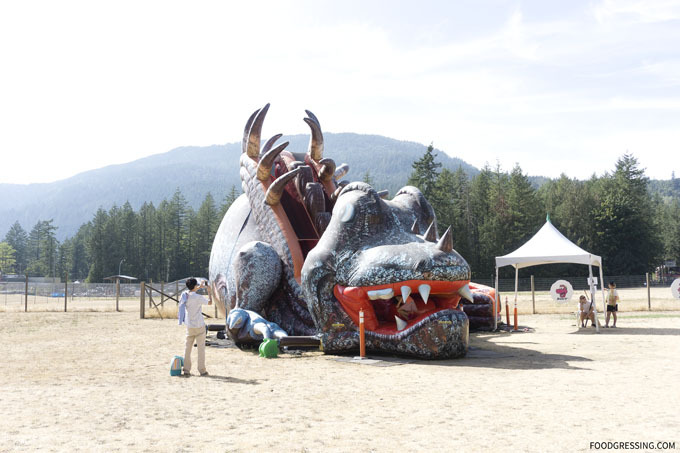 As one of the more unique family-friendly attractions in the Okanagan, my family and I visited the farm last fall on our week long trip to the Okanagan. 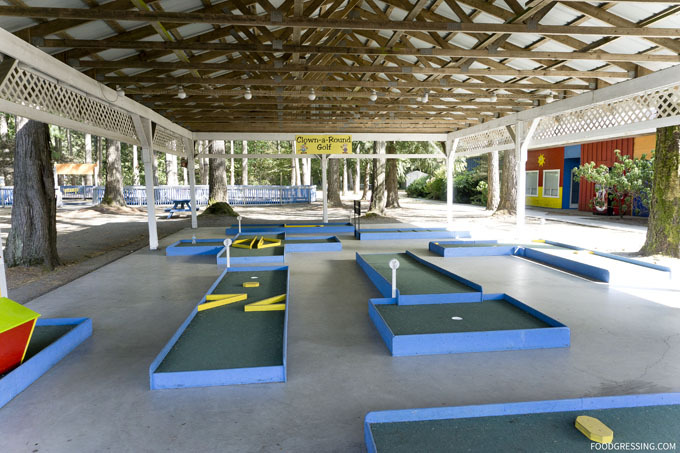 And next month, the farm is reopening on March 18 after a winter hiatus. So, I thought I would share with you this throwback review in time for Spring Break vacation planning. 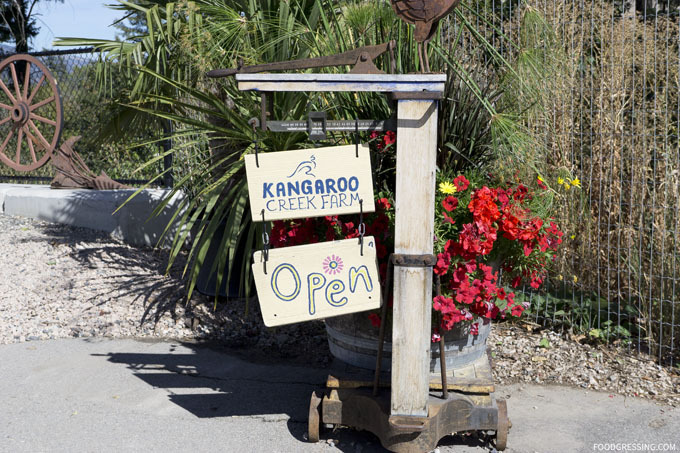 Kangaroo Creek Farm is located in Lake Country which is about a 20 minute drive from Downtown Kelowna. There is parking on the side road and you need to walk down a steep hill to get to the farm. While dirt, uneven ground, fur are expected at a farm, I found the grounds at Kangaroo Creek to quite well kept. We were able to navigate our stroller throughout the farm for the most part. Admission is $10 adults, $5 Youth (anyone under 19), $5 seniors (65 and older). 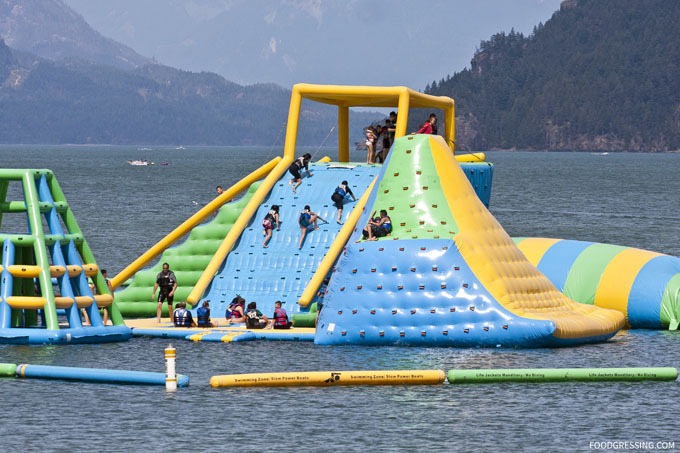 Children under 5 free. Most people spend about 1 -2 hours visiting. 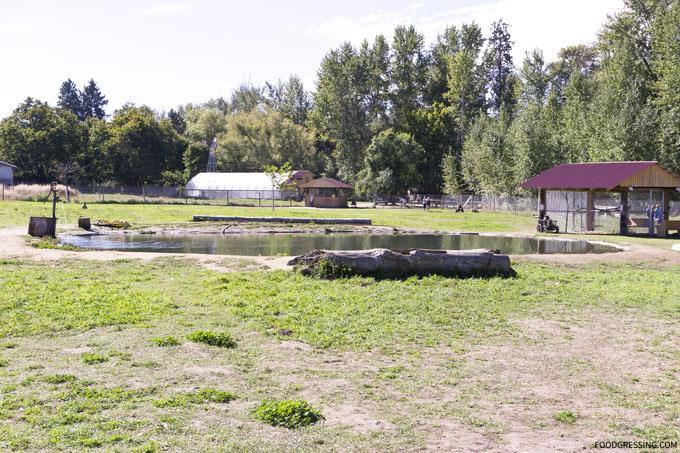 There are two enclosed areas where the animals are kept. 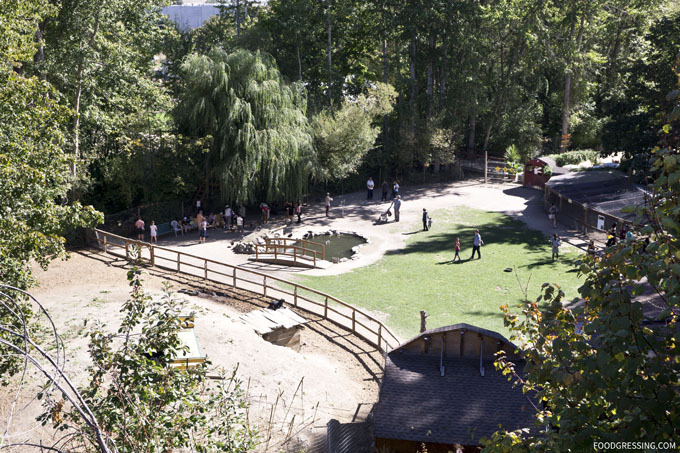 One area seems to be where the “larger” animals (like kangaroos, capybaras, wallaroos, wallabies) and the other for the “smaller” animals (like birds, joeys). 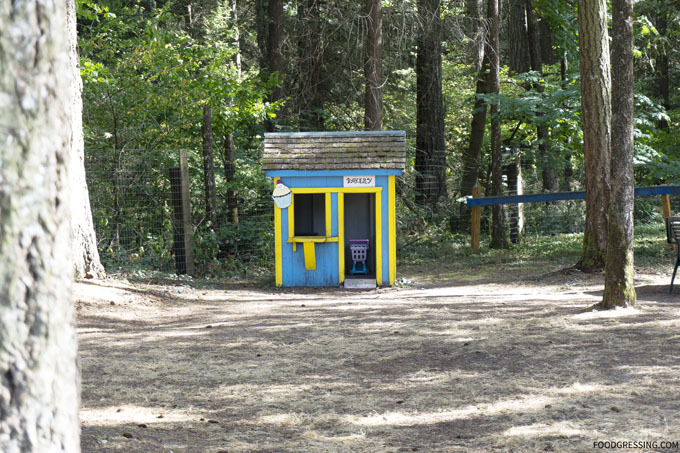 An old Huffington Post article shed light on how the farm came to be. In the ’80s, New Zealand was eradicating all non-native species, including kangaroos. These animals were considered pests that were competing with native species or displacing them. Unfortunately, these non-native species of New Zealand were being killed. 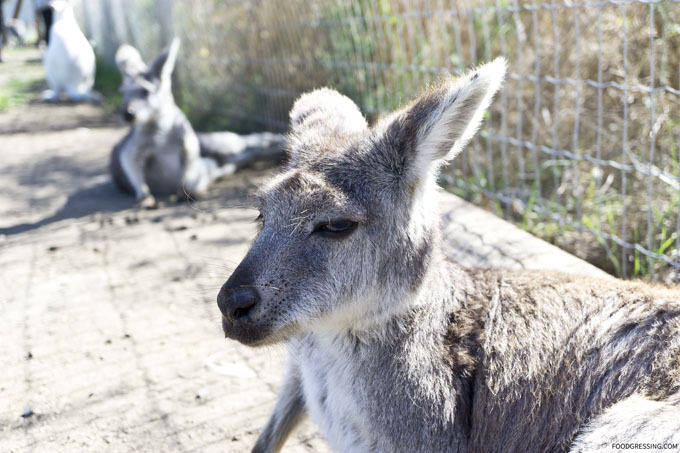 Kangaroo Creek owner Caroline MacPherson had a friend at the time who took on ten kangaroos from a New Zealand farm; these kangaroos would have been otherwise killed. They were resettled in Canada onto MacPherson’s farm, which was a then-government designated quarantine area. 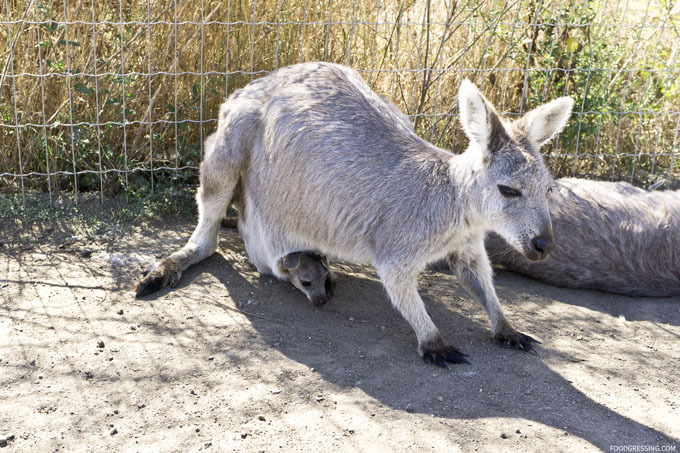 After making the move to work on the farm fulltime, MacPherson added capybaras, emus, goats and pigs to keep the kangaroos company. 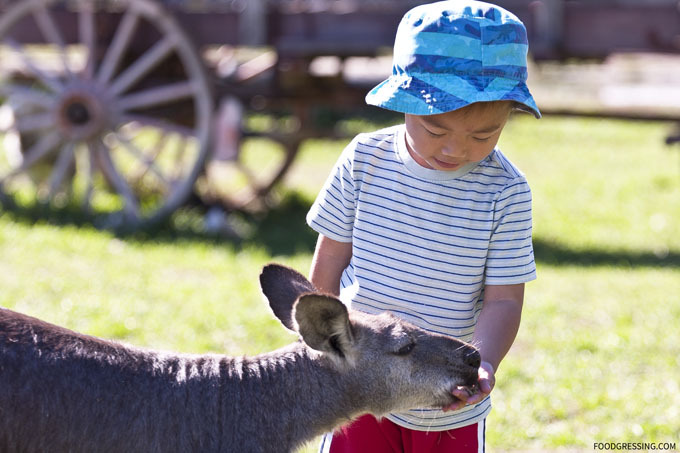 The kangaroos are obviously the main attraction of the farm and they are quite domesticated. The staff were around to give visitors food to feed the kangaroos. Having visited Australia five years ago, it was nice, warm feeling to see kangaroos again. And because it was a rather warm, sunny day, the roos were for the most part resting and hanging out in the shade. 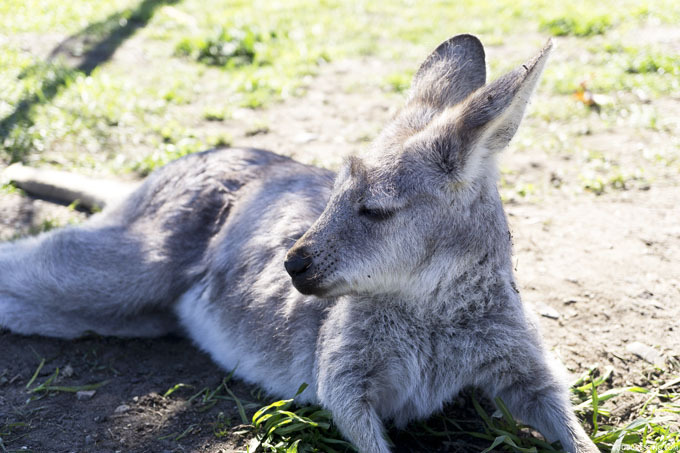 You can pet the kangaroos but only on their back. 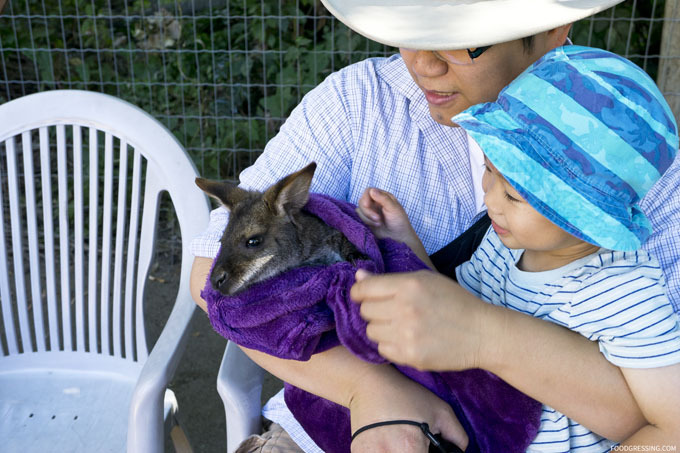 One of the highlights of the farm is that they offer a chance to hold the joeys. 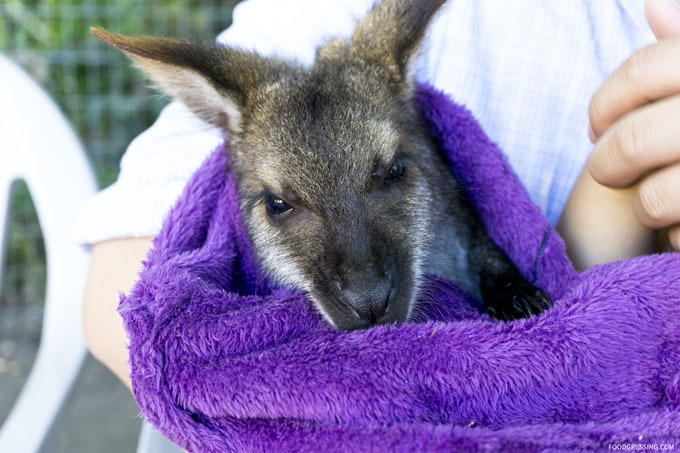 All visitors had to sit in a chair and wait for the handler to bring the joey. You only get a few minutes with the joeys before they are passed to someone else. They were all cozy and wrapped in blankets. 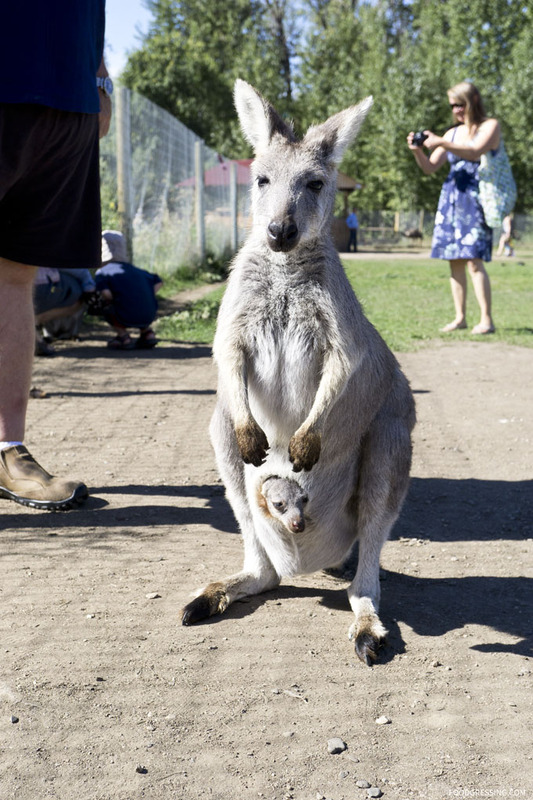 In the main area, you could see joeys in their mums’ pockets. Another memorable part of the visit was seeing the capybaras. 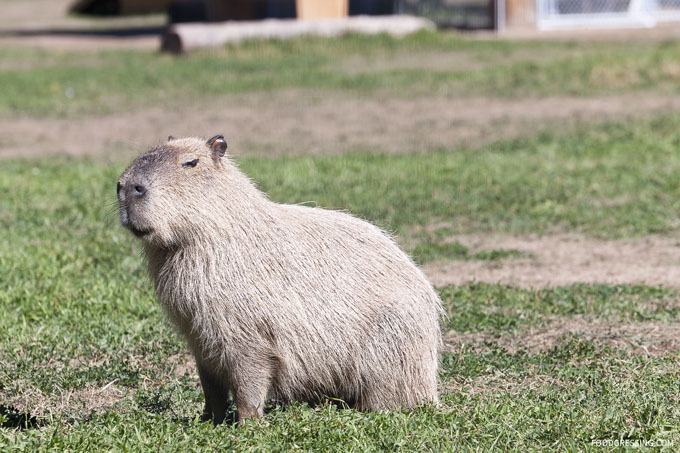 The capybara is the largest rodent in the world. At the farm, I felt like they gave a majestic kind of vibe. 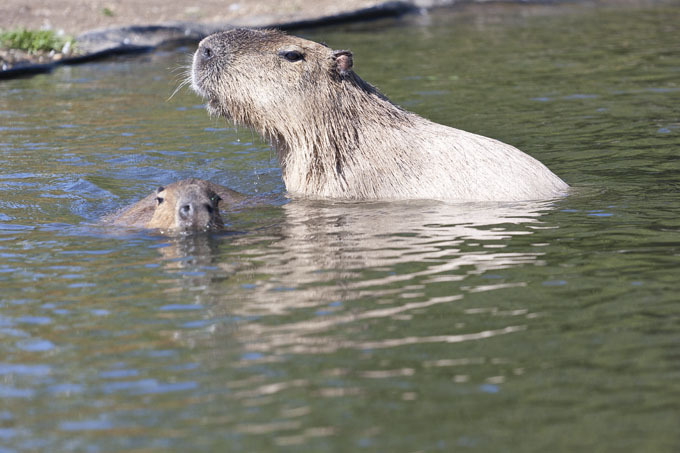 There was a small man-made lake were the capybaras could swim. 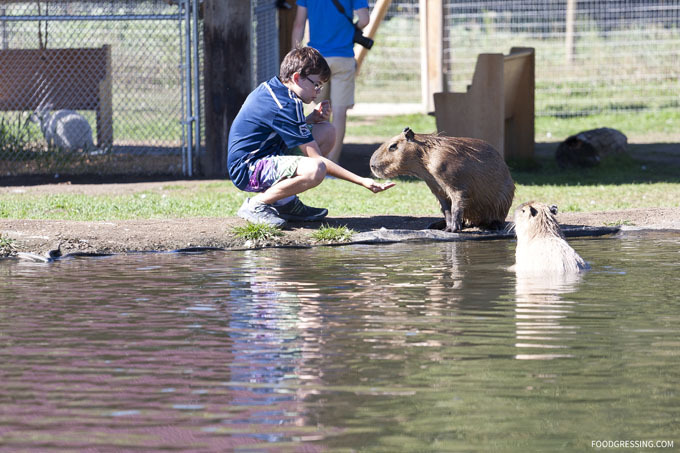 The capybaras did not mind being fed and were friendly to visitors. 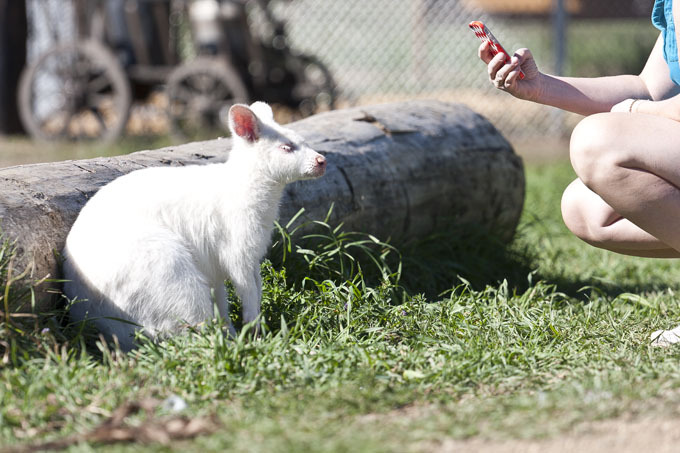 The farm also had an albino wallaby named “Irwin” in honour of the late Australian conservationist Steve Irwin. 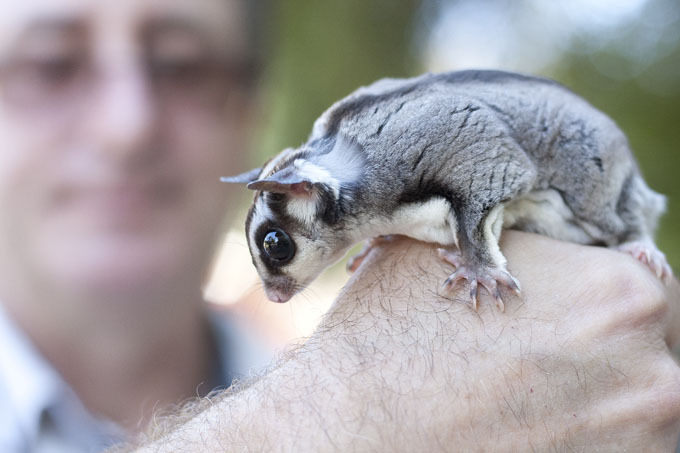 We got to know the sugar glider, which is a small, omnivorous, arboreal and nocturnal gliding possum. 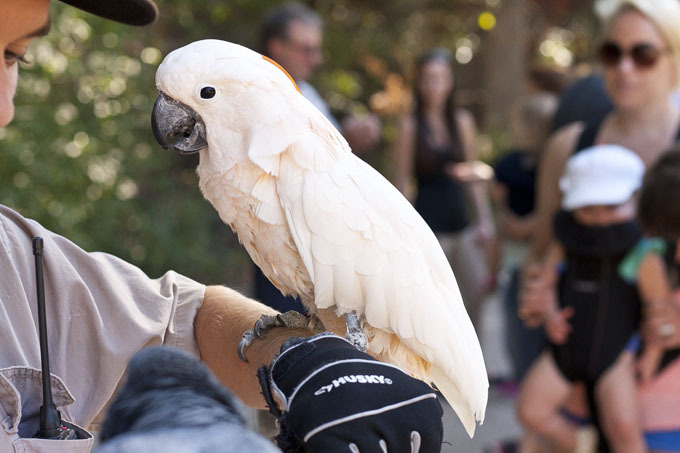 Staff presented a parrot to visitors at the farm. 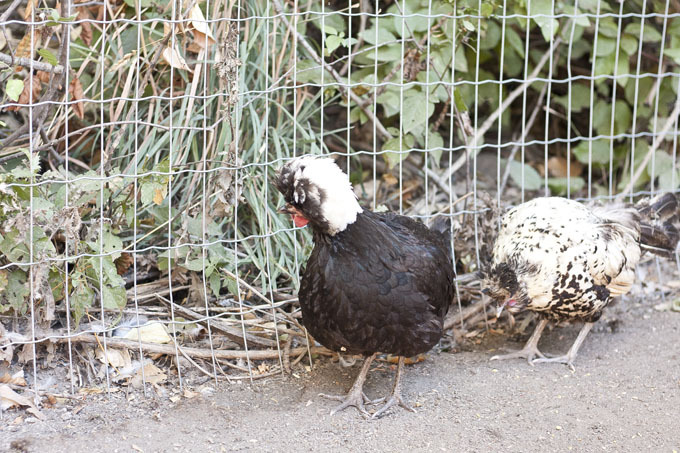 And there were chickens with very interesting feather patterns unlike those on typical farms. My family and I quite enjoyed the visit to Kangaroo Creek Farm which was educational and eye-opening. Getting up-close with the joeys was a major highlight. 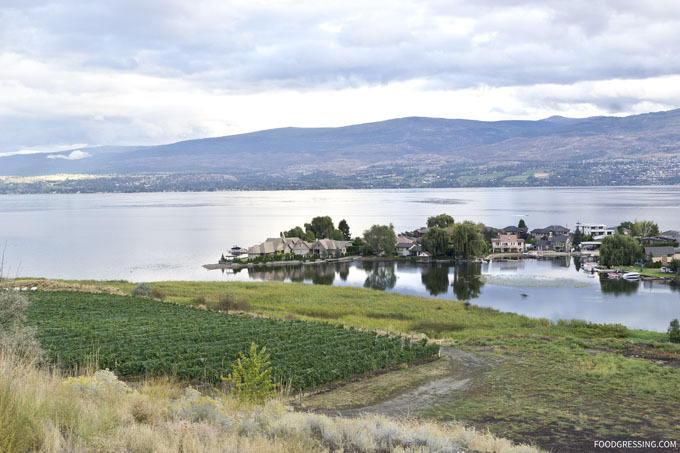 On our week long family trip to the Okanagan last fall, one of our stops was Kelowna where we stayed for a few days. 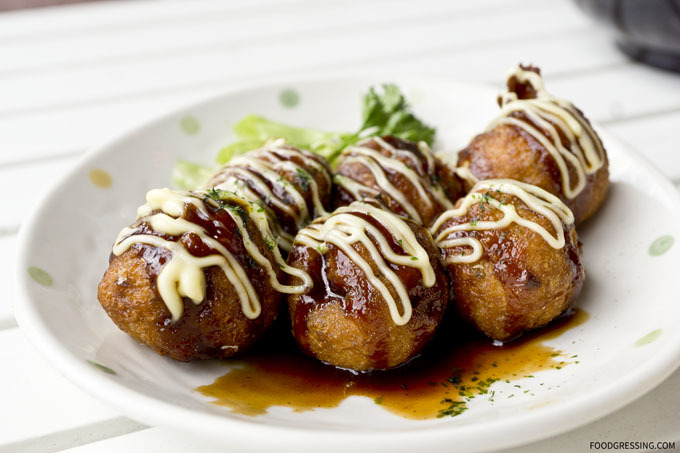 In the mood for some light yet still comforting eats, we stumbled upon Ume Foods after visiting the Dollarama nearby. 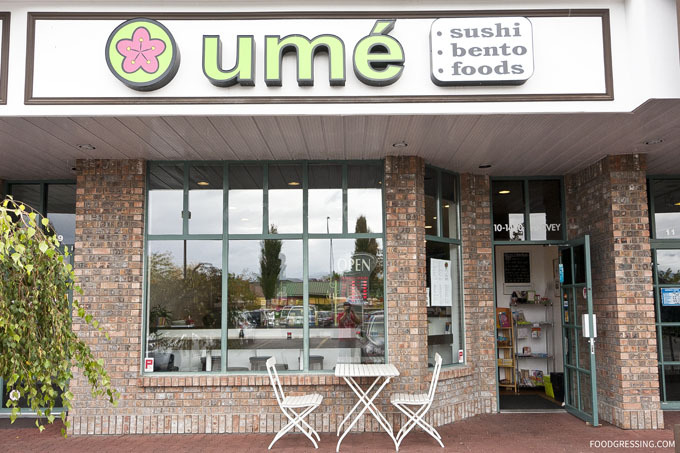 Ume Foods is a Japanese mini-market and restaurant in a strip mall offering Japanese snacks, sushi and bento boxes. A quick research online showed that they had favourable reviews online so we decided to give Ume a try for a light meal. On the inside, there are about two small aisles of Japanese snacks. The ordering counter for food is at the back. There are a few dining tables along the side wall, near the front and on the outside. 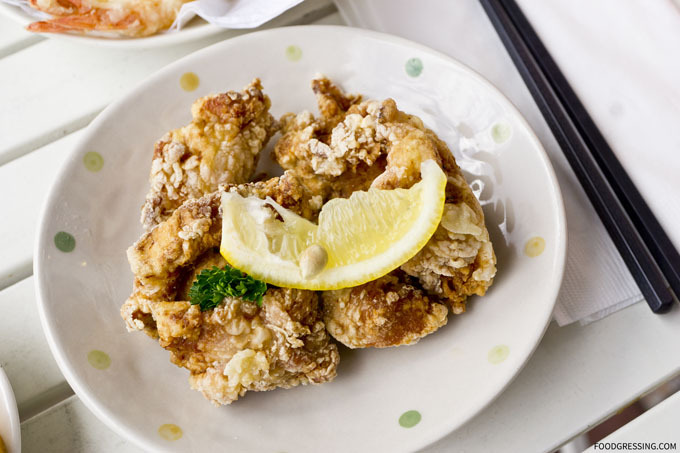 To start, the chicken karaage was solid. 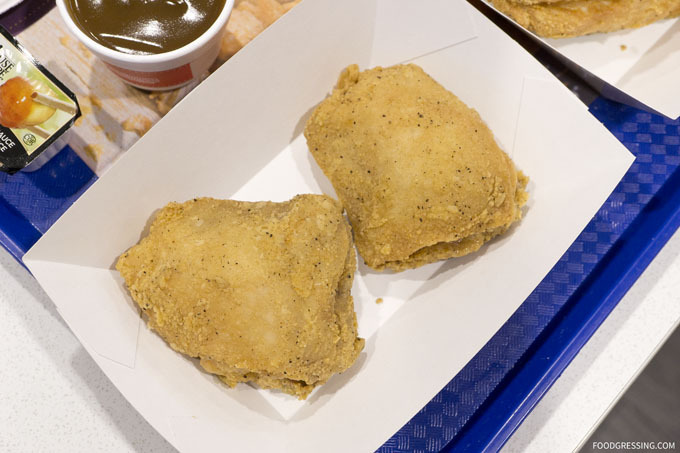 It was lightly battered on the outside and juicy and tender on the inside. 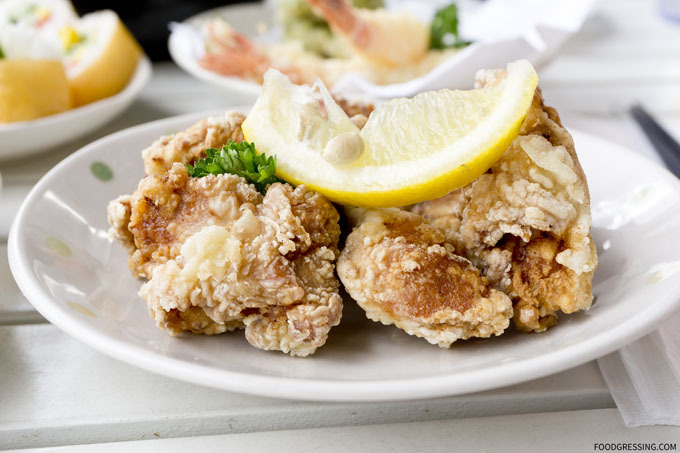 When I handled the karaage, I liked that it wasn’t too greasy. At $3.50 each for 6 pieces, I thought the takoyaki price was good compared to what it charged at the night market. 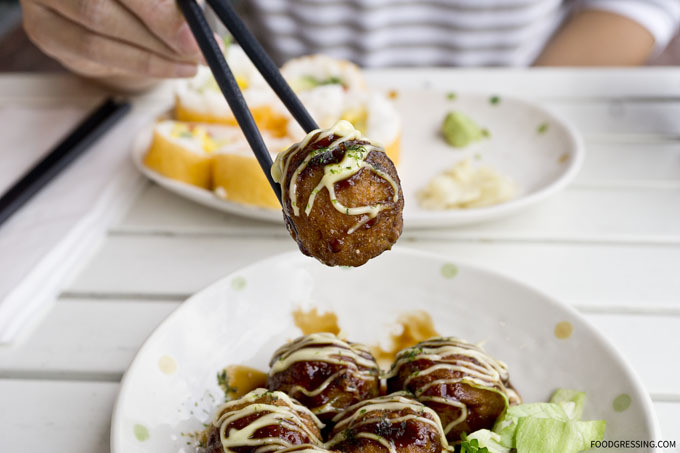 A little bit sweet and savoury, these deep-fried balls made with minced octopus and tempura scraps were scrumptious. 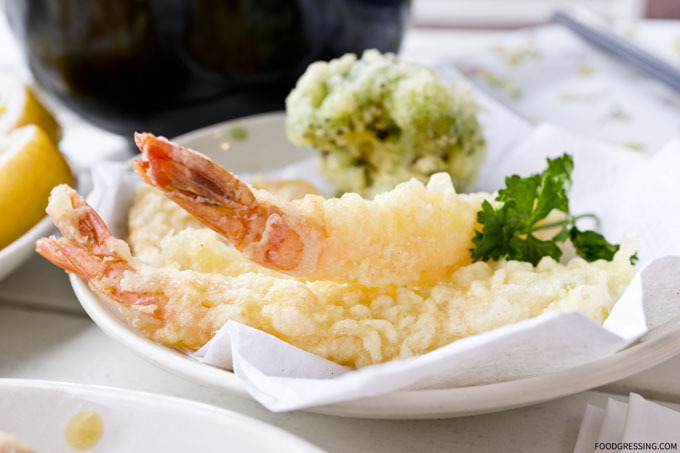 The tempura pieces were lightly battered, crispy on the outside and very tasty. 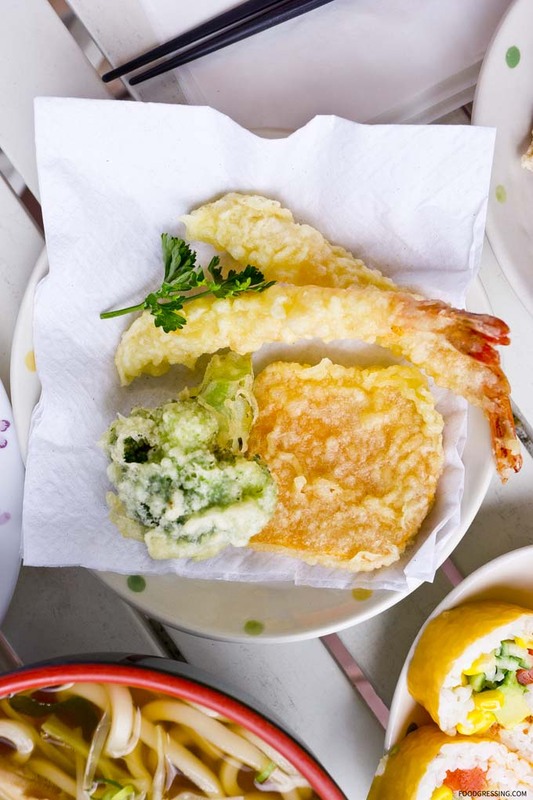 The tempura given were zucchini, prawn and sweet potato. The Ume House Roll had a cute sakura-inspired presentation. 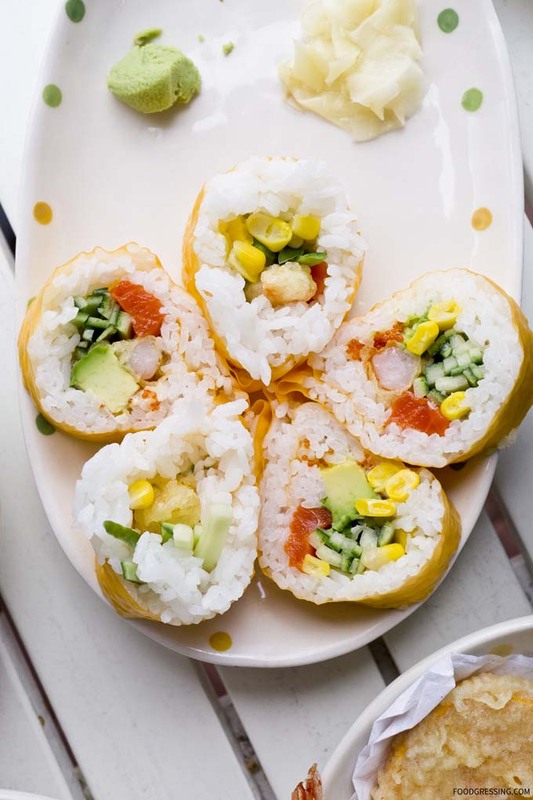 It had prawn, tempura, salmon, avocado, cucumber, corn, mayo, and tobiko. 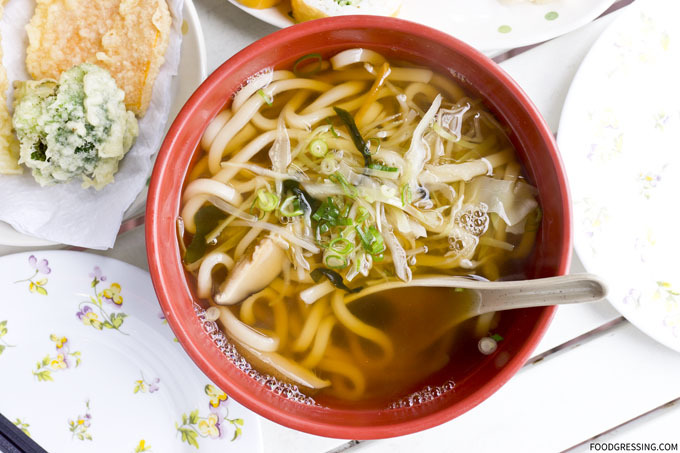 The udon came in a simple, light yet still delicious broth. Dowtown Kelowna Pizza: DunnEnzie’s Pizza Co.
DunnEnzie’s Pizza Co. is local favourite in Kelowna having been voted best pizza by diners. When my family and I were on a road trip in the Okanagan, we stopped by their Downtown location on Ellis street (the other in the Landmark Towers) to see just how good their pizza was. DunnEnzie’s sells pizza by the slice of by the pie and they do takeout and delivery. 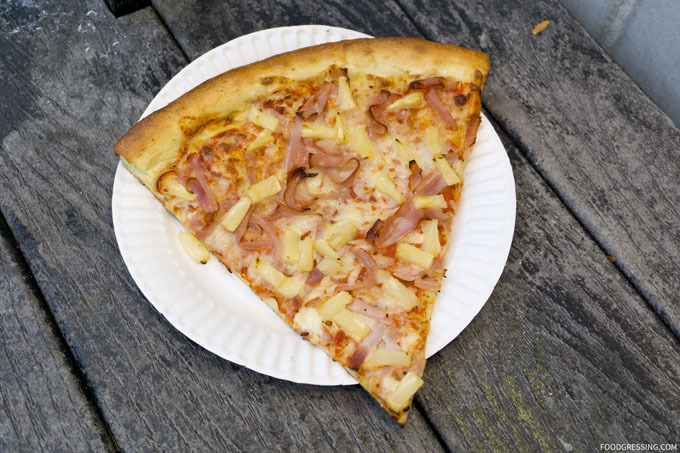 They are known for their “huge” slices which are $4.75 each. 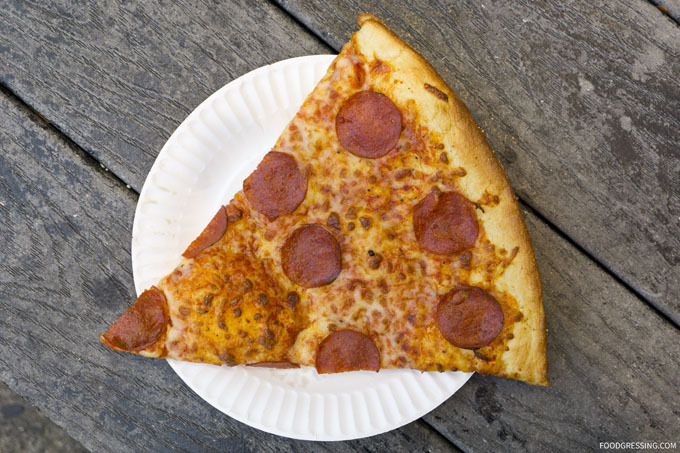 Their pies range from $18 for medium size pizza with traditional toppings up to $25 for a large specialty pizza. 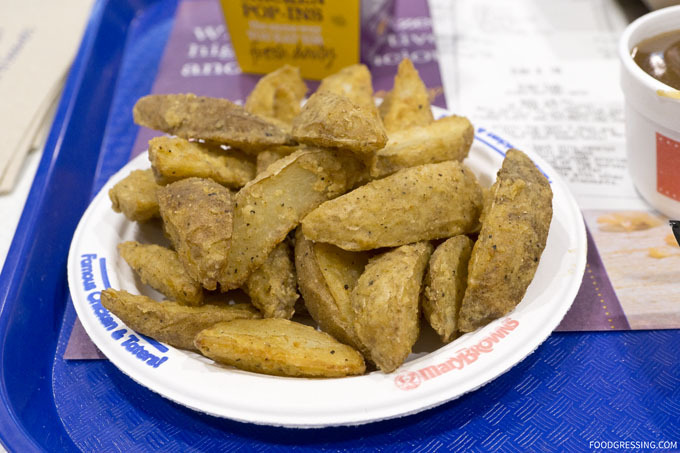 Some of their interesting specialty flavours include butter chicken, chicken or beef taco, and perogy. They also have gluten-free and vegan options. Their menu is available on their website. The interior of DunnEnzies seems retro-inspired. 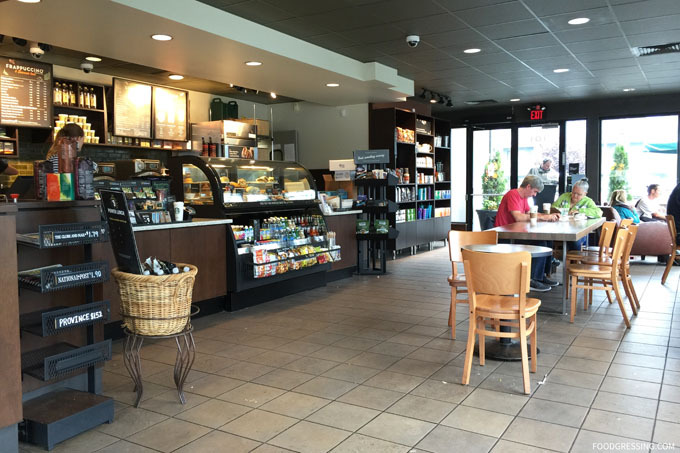 There are bar stools and counters along the wall and window, but no dining tables. You can also enjoy pizza outside as there is a bench. We went for a few pizza slices in their warmer and the traditional flavours: pepperoni and Hawaiian. The slices were pretty big and valued reasonably at $4.75. 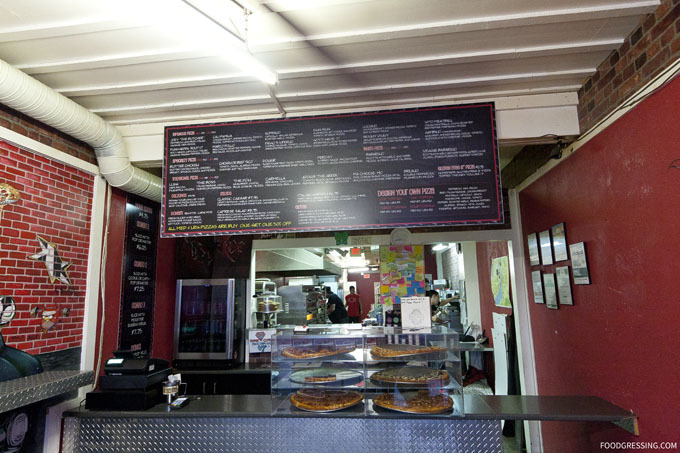 Their pizzas are not Neapolitan-style just regular fast-food pizza with a thicker crust. I thought the pizza to dough to toppings ratios were reasonable. However, I did feel that the pizzas were a bit dry – something common with pre-made pizzas sold by the slice and placed in a warmer. The pizzas were just okay to me and not so much of a wow factor. This could be because I just went with traditional flavours rather than the specialty ones. And the pizzas by the pie probably taste better than ones by the slice. 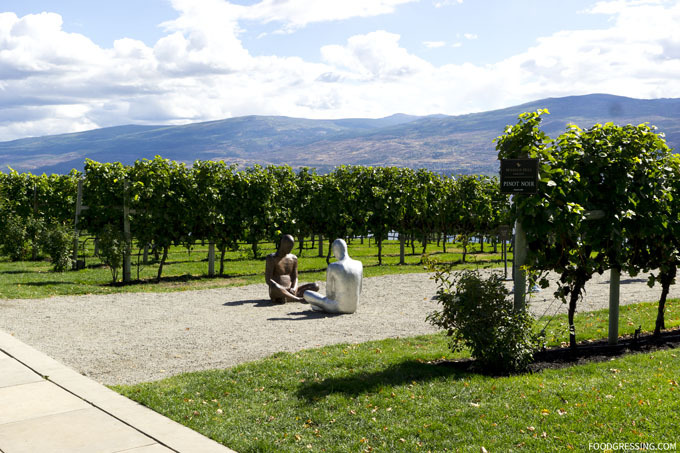 No visit to the Okanagan region would be complete without a stop at the world renowned Mission Hill Winery in West Kelowna. 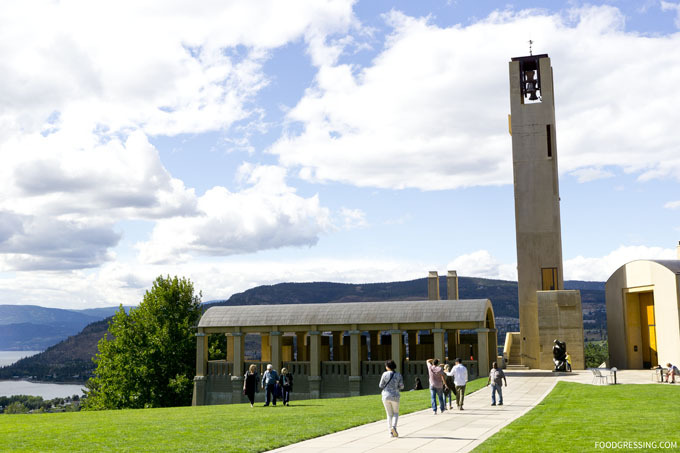 Known for their award winning wines, handsome architecture against breathtaking views of mountains and lake, Mission Hill Estate is certainly a top place to visit for locals and visitors alike. 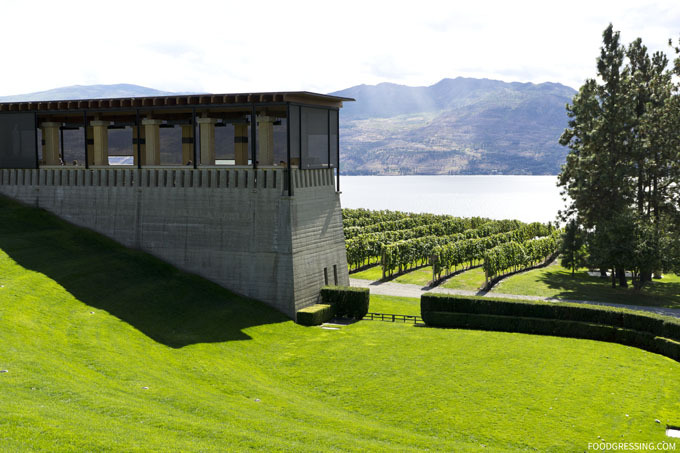 In 2015, Mission Hill Family Estate was heralded ‘Canadian Winery of the Year’ for the 6th time. This past fall, my family and I paid a visit to the infamous Mission Hill. And the timing was just right as the rain had just let up and let the sun in. 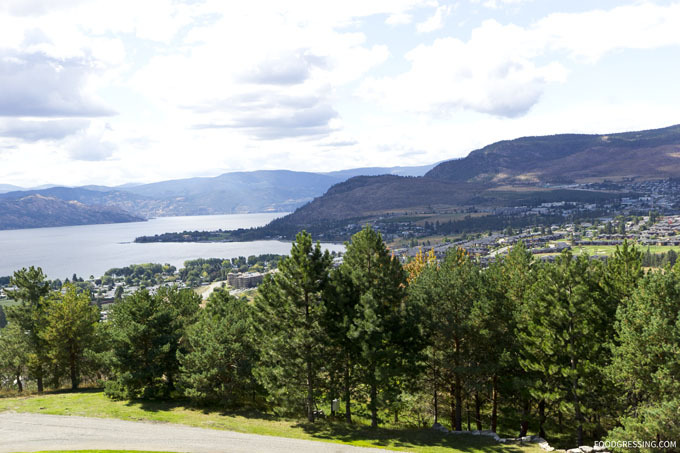 Located on top of a hill, the winery is perfectly positioned to capture the scenic views of the mountains, lake and valley below. The estate architecture is outstanding and resembles a fortress but with immaculately manicured grounds. 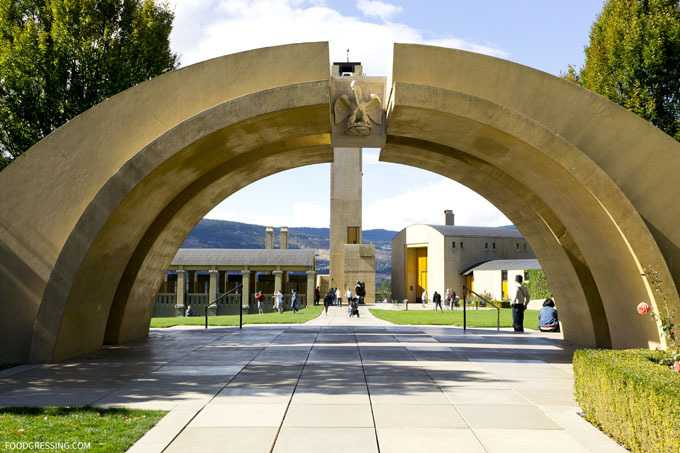 Visitors entering through the main winery grounds first meet dramatic curved arches. 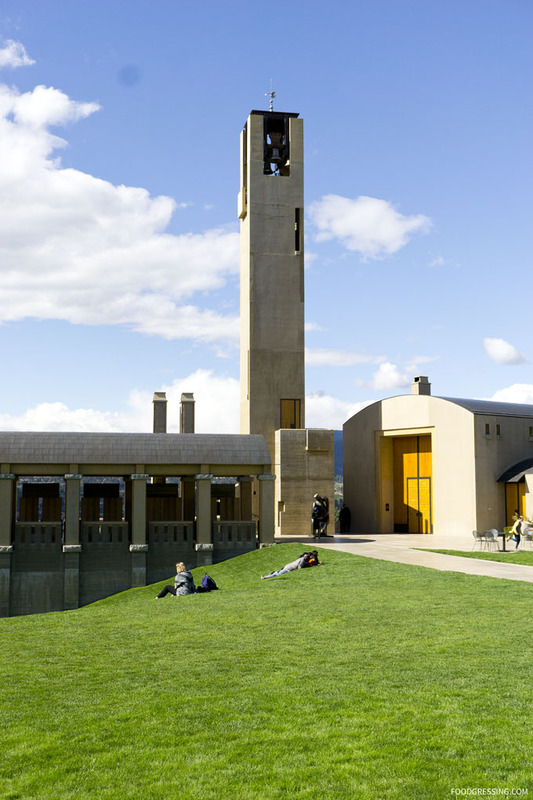 A main focal point is an impositing 12-storey tall bell tower. 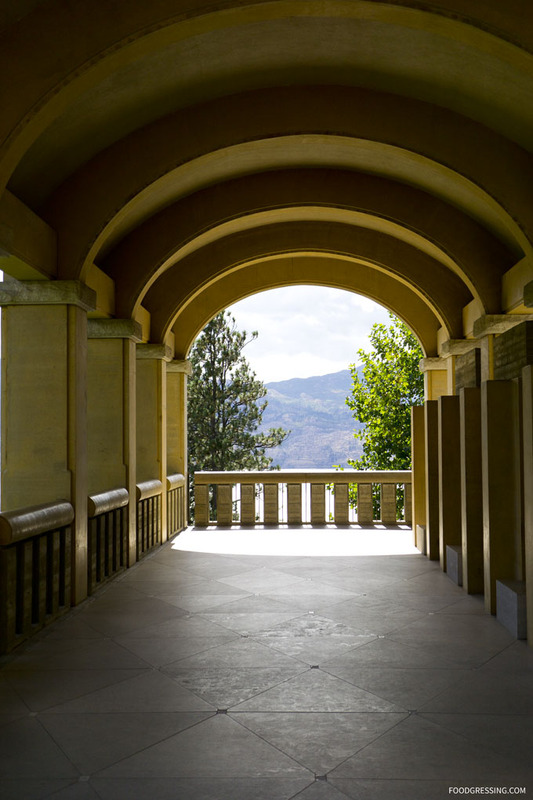 The courtyard seemed to be the perfect place to wander, enjoy the grounds and take in the spirit of the Okanagan. Dramatic arches are prevalent in the winery’s architecture. 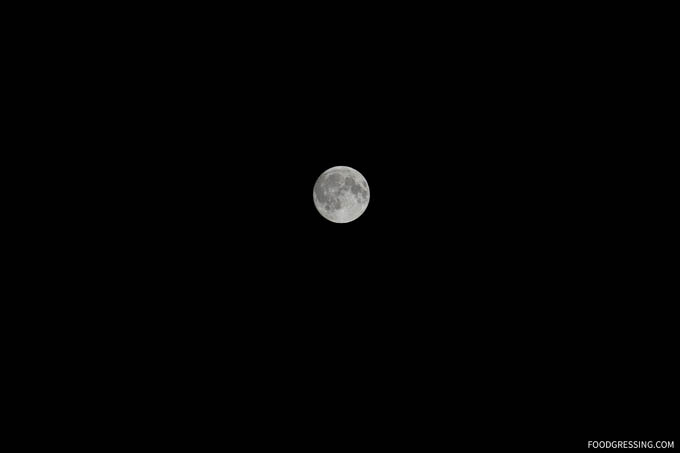 They are enigmatic and alluring. The Terrace is Mission Hill’s award-winning restaurant. 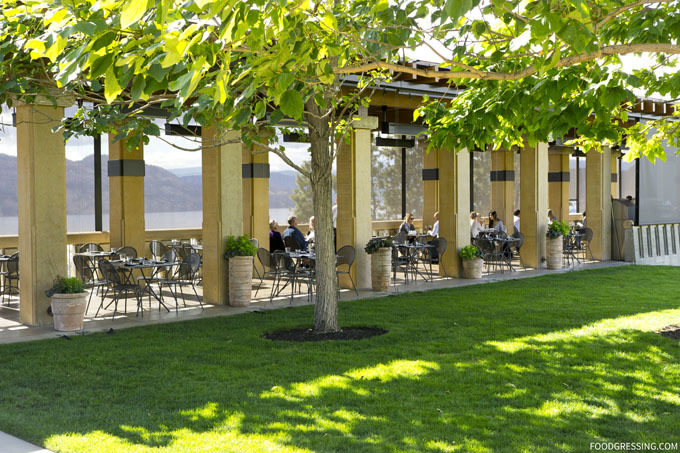 Diners can enjoy a memorable dining experience while overlooking rows of Pinot Noir and Chardonnay vines and with a panoramic view of Lake Okanagan. The Terrace is only open from May to October for lunch and dinner service. And while it would be nice to be able explore the grounds more thoroughly, you can only do so if you sign up for one of their tours. 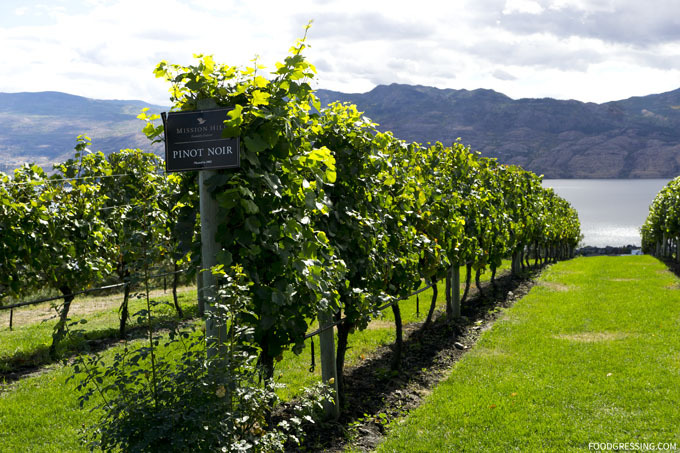 Otherwise, you’re restricted from passing through the vineyards which are supervised by Mission Hill staff. The Wine Boutique has wines for sale as well as some tasting bars where pay a fee to try some of their wines. All in all, it was a very beautiful visit to Mission Hill Winery. 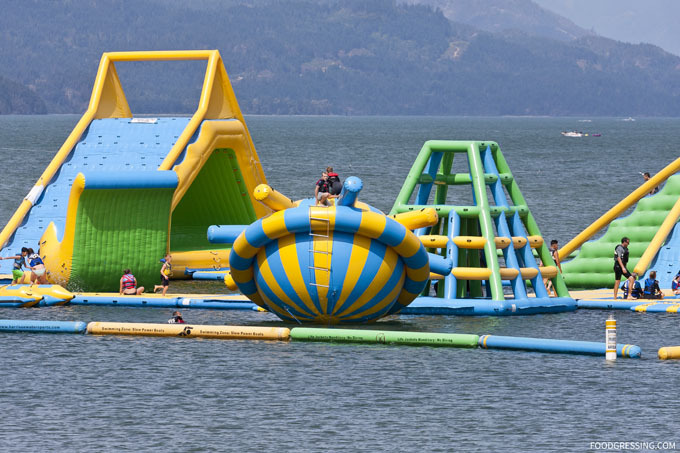 Definitely worth a visit and I’d recommend anyone going to Okanagan to stop at their estate. I must admit that I’ve become a bit of a bubble tea addict lately. 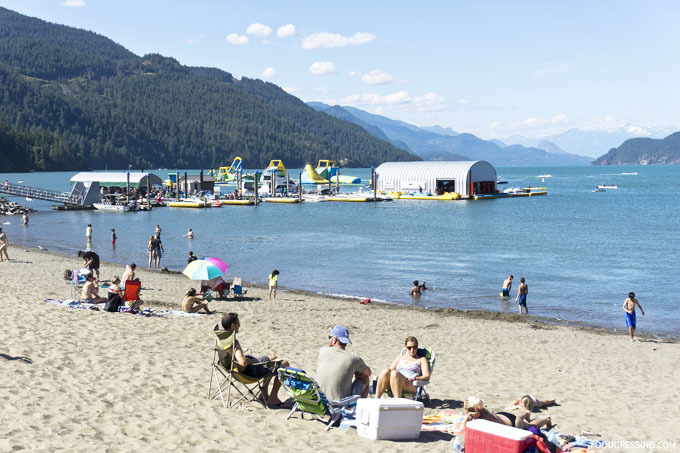 So, when I was planning for our trip to the Okanagan last month, I researched potential bubble tea spots. Not that I was expecting International chains like Chatime or Gong Cha to be there, but more like local bubble tea houses. 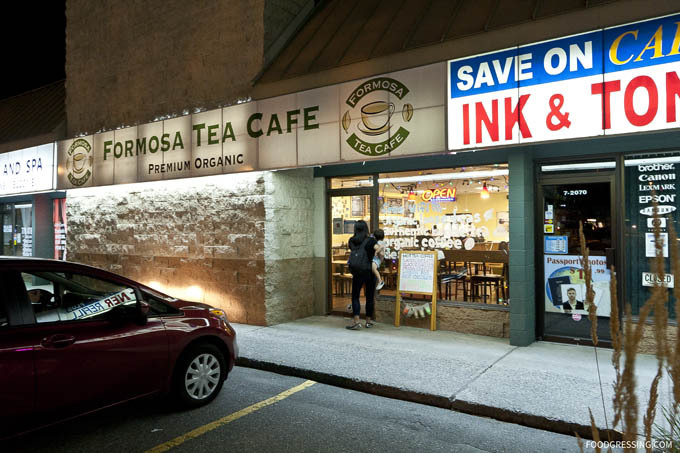 What turned up in my search was a small, family-owned Asian cafe in Kelowna called Formosa Tea Cafe. One evening after dinner, my family and I decided to visit Formosa for a bubble tea fix. 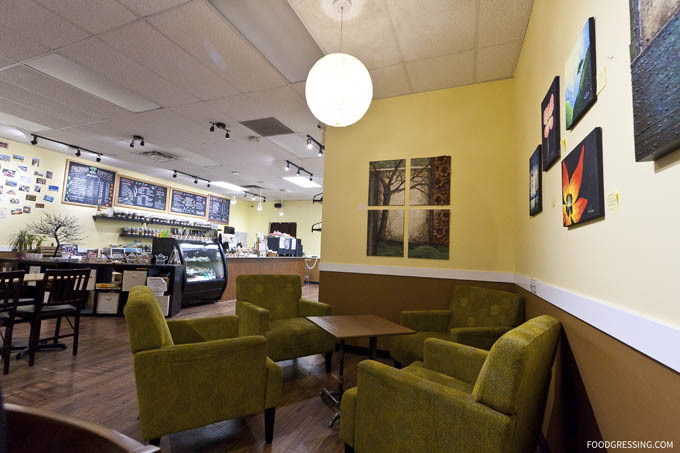 The interior of the cafe is very spacious and inviting. There are couch areas, arm chairs, a communal table and a few dining tables. It seemed like a cozy place to hang out with friends, to get work done on your laptop, or to spend a lazy afternoon with your favourite book. The walls are adorned with art pieces by local artists. Formosa also has a collection of classic board games for customers to enjoy. 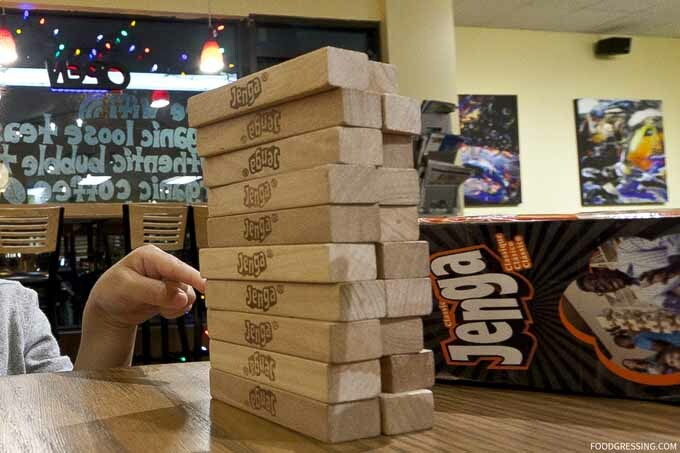 My family and I played a bit of Jenga that evening. 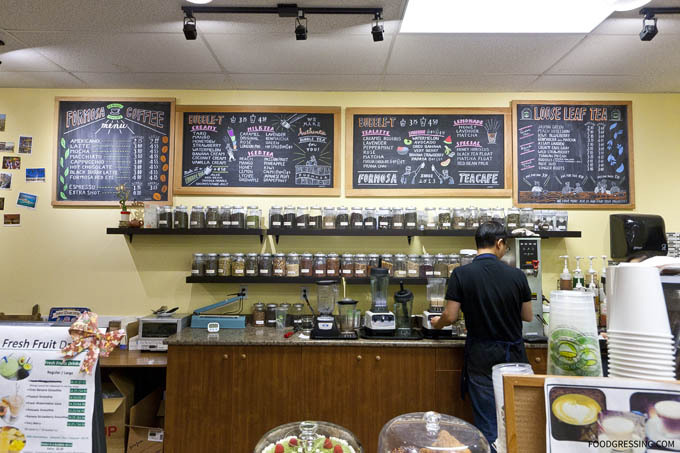 Formosa specializes in premium organic loose leaf teas, bubble teas and espresso-based beverages. 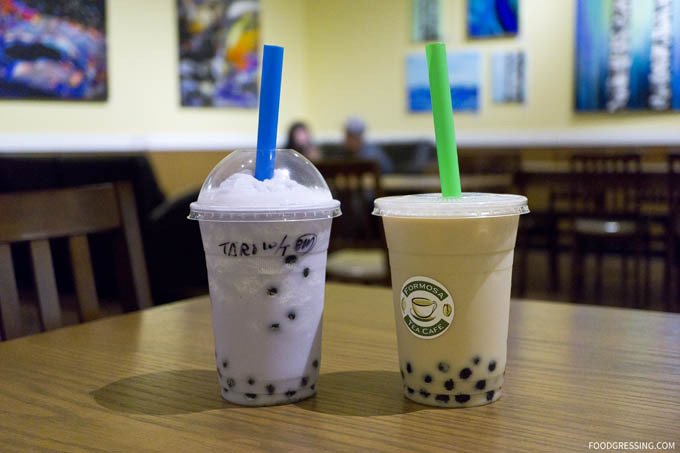 Bubble tea comes in two sizes: regular ($3.75) and large ($4.50). 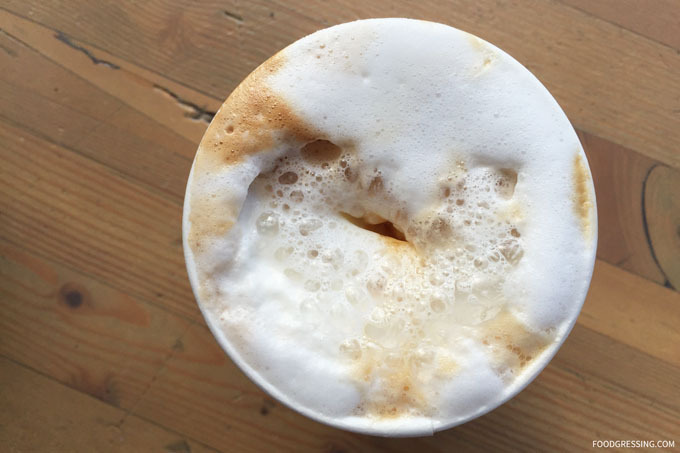 Choices include creamy flavours, milk tea, iced tea, smoothies, tea lattes, smoothies, lemonades and more. Toppings are $0.50 and include tapioca pearls, aloe, red bean, coconut and lychee jelly. We played it safe and went with a taro and classic milk tea with pearls. 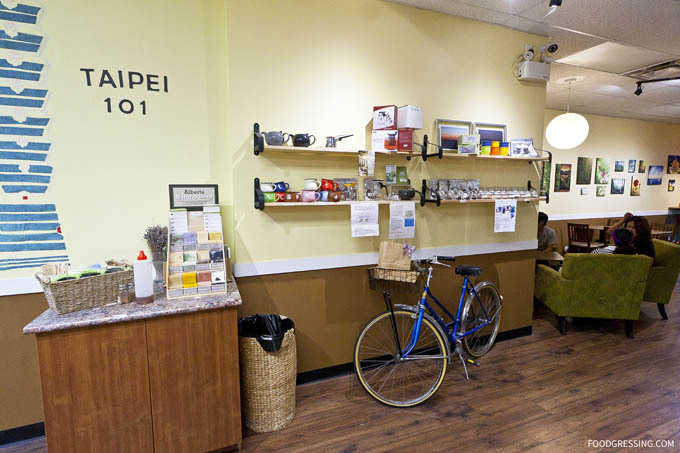 I thought the drinks were okay for a small, local bubble tea place. The tea flavour could be stronger but the tapioca pearl texture was reasonable. Smooth, slightly soft on the outside and chewy to the center. 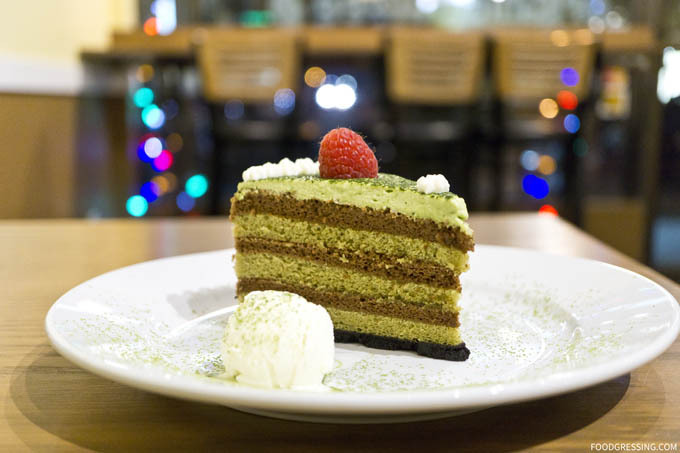 We also tried their house-made matcha chocolate cake. Even though it was near closing, the cake was still quite moist, fluffy and light. Really nice balance of matcha and chocolate flavours without being too sweet.